In February, winter sports teams participated in playoffs. Mt. Hebron was represented by the boys’ and girls’ basketball teams, indoor track and field, wrestling and ice hockey teams. Even though boys’ basketball previously lost multiple seniors and had to rebuild with a stellar amount of young talent, they were still not far behind and had convincing wins. They held a 9-13 record overall, with a Championship title in the Winter Holiday Tournament along with other wins over top tier schools, including Hammond. Their in-county record was 6-13, and the Vikings remained competitive in almost every one of their games. “Our shooting ability has kept us in games and helped us win games,” Madden also explained. The Vikings were the seventh seed in the Howard County Times top 10 power rankings. Unfortunately, they lost their first playoff game against Reservoir on Feb. 26, with a final score of 54-49. Girls’ basketball was in the same situation as the boys’ team; both had multiple star seniors graduate last season. But junior Shane Devine and senior Peyton LeConte, a few of the only returning players from last year’s varsity squad, provided excellent leadership for the Lady Vikings. A few of the impressive wins from the girls’ season include placing second in the Winter Holiday Tournament and defeating tough teams, including Marriotts Ridge and Hammond. Sadly, the Lady Vikings lost their first playoff game against River Hill on Feb. 26. The final score was 46-36. The Mt. Hebron Indoor Track team is very well known around the county, region and state for their performances throughout the years. Last year, the boys’ team won Counties and Regionals and was nine points short of the State Championship. At the 3A regional meet, the boys’ placed 3rd overall and the girls’ finished 8th overall. The Indoor State Championships were held on Feb. 23. The boys’ placed 7th overall, while the girls’ placed 21st. Senior Justin Johnson ran three events and placed in the top five in all of them. He placed third in the 500, fourth in the 800 and participated in the 4×400 meter relay that placed fourth. Senior Greg Bisant came in sixth in the 800 in the same heat as Johnson. Junior Nathaniel Hatcher dropped his time at the Regional meet in the 55 meter dash from a 6.74 to a 6.67 at the State meet. He also contributed to the 4×400 meter relay team. Junior Julia Shanley finished second in the high jump, clearing a height of five feet. Senior Danielle Pitts finished 10th in shotput, throwing a distance of 29 feet. Sophomore Lexi Banham finished eighth in the 800 meter, with a time of 2:30. And sophomore Emmy Beyer finished ninth in the 3200 with a time of 12:11. Along with many other Mt. Hebron sports teams, the varsity wrestling team lost a lot of their players from last year. Eleven seniors graduated from the class of 2015, which caused the team to rebuild their core. Junior Jimmy Hayden and senior Eloy Flores have stepped up to become the leaders of the team. Another standout wrestler this season includes sophomore Nick Nordhausen, who has taken a very big leap from last season. The wrestling team as a whole ran a very good campaign, finishing at 6-8 overall and 6-5 in the county. At the County Championships, Flores placed third place in the 145 lb. weight class by a margin of 5-4, while Hayden also placed third place in the 138 lb. weight class. 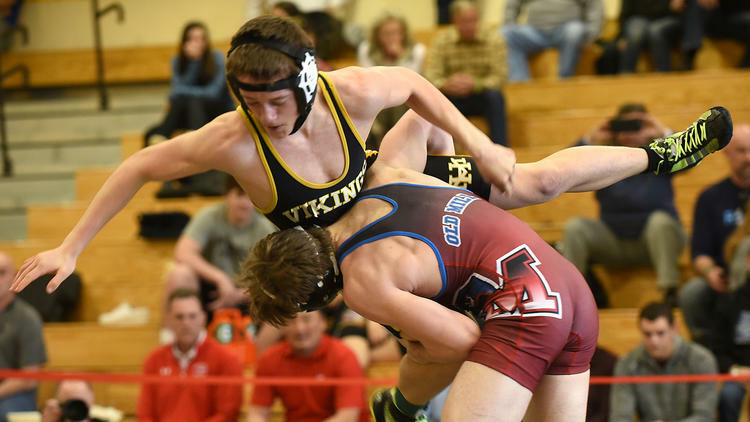 Other notable standouts during the County Championships include sophomores Jamison Hulbert and Ali Pender, who placed fifth place in the 126 lb. and 132 lb. weight classes, respectively. At the Regional Championships, Nordhausen lost in the semifinals for the 220 lb. weight class, while Hayden placed third in the 130 lb. weight class. Both of these standout wrestlers will be competing at States on March 5. Although the regular winter season has come to a close, the playoffs provided many opportunities for Mt. Hebron teams to display all they have accomplished this year.